Here at StoneGable we are big, big soup eaters! No wimpy soup either. We love hearty, full-of-flavor soup that eats like a meal. 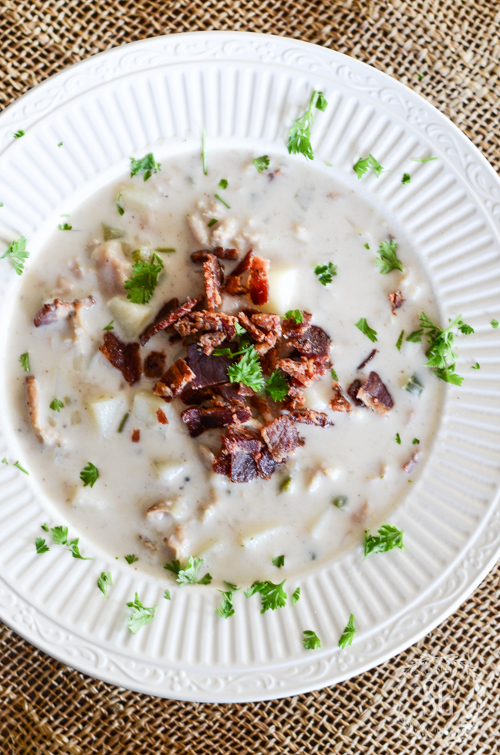 And clam chowder is one of our favorites! Chowder has a history of being chocked full of chunks of fish and potatoes and onions. And this clam chowder is the definition of the best chowder! The broth is creamy with hints of the sea and the clams and potatoes are big enough to savor. Add to the mix the smokey flavor of bacon and sweetness of onions and you have a perfect storm of flavors! Don’t save this recipe for company, it’s quick and easy enough to make for dinner on a weeknight! 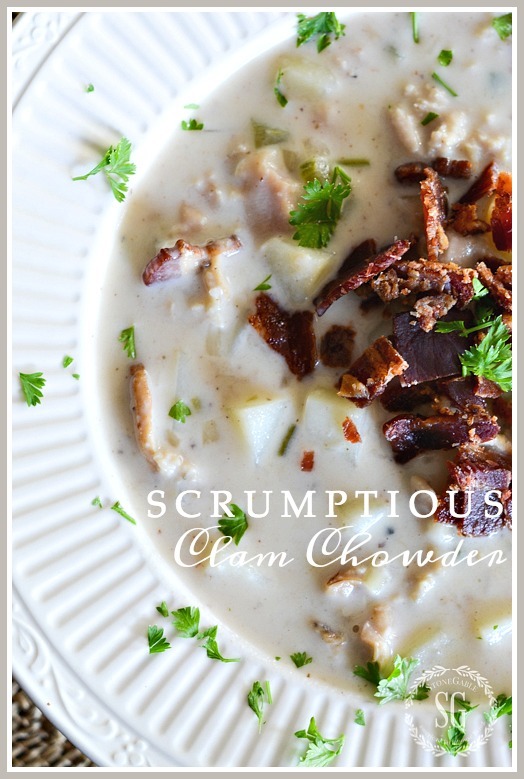 Let’s make Scrumptious Clam Chowder! 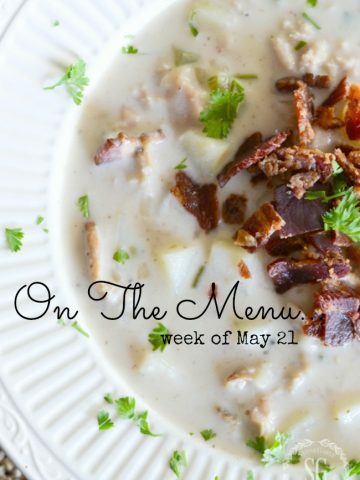 I keep all the ingredients in my pantry and freezer so I can make this yummy clam chowder whenever I need a delicious, easy meal! Add potatoes to a saucepan of cold water and cook until just fork tender, about 8-10 minutes. Check potatoes. They should not be too soft. Melt butter in a large Dutch oven over medium heat and add bacon. Cook until it begins to brown. Add onions and celery and cook until they begin to soften, about 6 minutes. Do not brown veggies. Add garlic and bay leaf and cook for one minute. Stir in flour and cook for 2 minutes stirring once or twice. Whisk in the reserved clam liquid. Simmer for 10 minutes on low stirring frequently. Serve hot with oyster crackers. Clam chowder can be made ahead and refrigerated. I like it better the next day! Serve with a salad for a great easy meal. 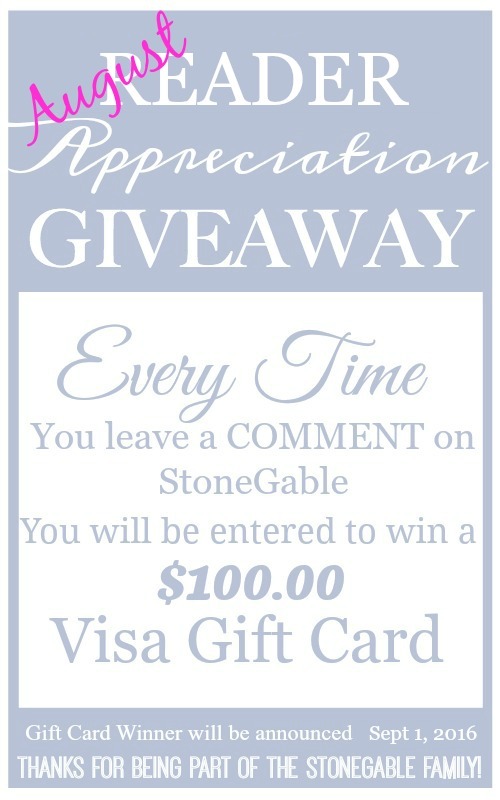 Don’t forget to comment and enter this month’s giveaway! You might like to follow me on Pinterest. I revamped my entire site to make it easier to peruse! See it and follow HERE. I’m not the one to ask Kathleen. I would never want to tell you something that might not be right for your sensitivity. Ask your doctor. Hope he as some tips for you. The clam chowder recipe was delicious! Thank you. 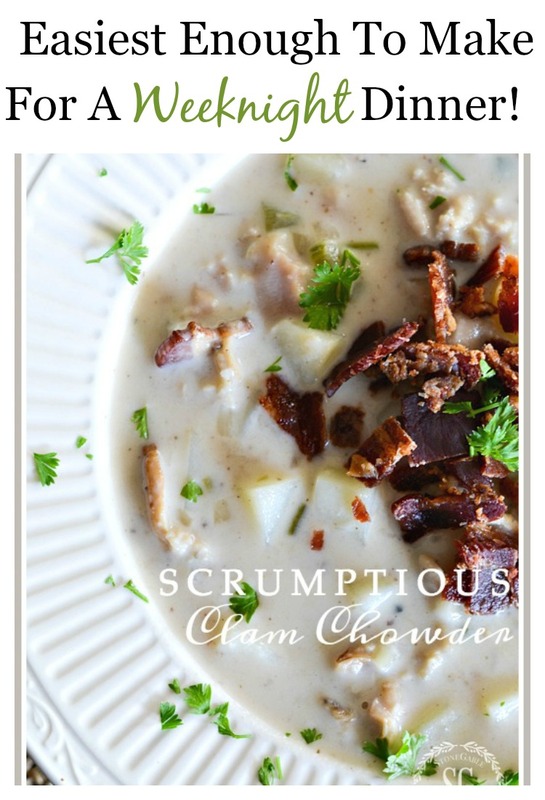 That chowder looks fantastic and easy to whip up, too! Thanks for sharing that one. 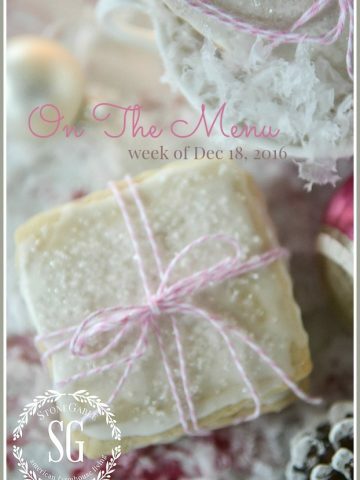 I’m new to your blog, and I am really enjoying it. I’ve been following you on Pinterest for a while and just never made the connection. Keep up the good work Yvonne! Ohhhh – enjoying a big bowl of this tonight with football! It’s my husband’s new favorite of your entire repertoire of soups! Great recipe. I altered it a bit based on what I had on hand and add a pinch of dill. Delish! Thanks! I make this all the time. My family loves it. I microwave the potato’s until a fork goes in easily. Just a shortcut! This recipe sounds so easy and delicious! Can’t wait to try it. Love the idea of a bacon topping. Thanks for the recipe. Clam Chowder is my favorite soup!! !….I am saving this recipe!….Now do you have a favorite brand of canned clams? Thanks for the recipe Yvonne! Love love love clam chowder. Didn’t know you could make it ahead and reheat. Thought the half and half would separate. Good to know. I like many soups and stews the next day. Can’t wait to try it! Gonna serve with a crusty bread do some dunking! My husband LOVES corn chowder…can’t wait to try this! Sounds like a perfect soup for my new soup bowls! Yum. This will be perfect this winter. 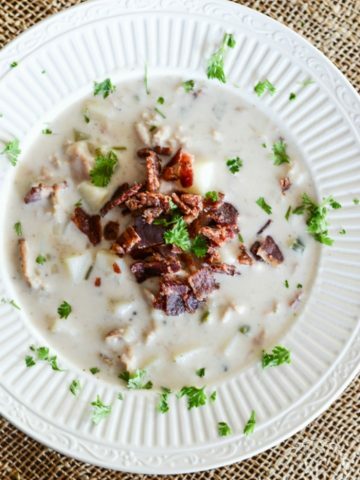 Now your clam chowder certainly looks delish for sure- but in sunny south Florida we are still in the throws of summer and soup won’t be on the menu for quite awhile. Im going to pin this and rethink this one in January! It’ll be perfect then! Yum. What I love about chowder and soups like this is that they are a meal. If soup is loaded up like this one, that is all you need for dinner. 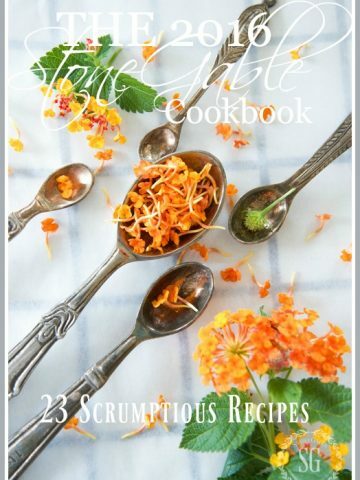 Pinned it to my list of recipes to get on to our table. Thanks. Thanks, Katherine! I love my pinners!!!!! Looks Yummy! I cant wait to make it! You make the kind of soups my family loves. Thank you for what you do and who you are. Character does matter. This chowder looks scrumptious! And, I agree, chowder and soups taste better the second day. Thank you for sharing this recipe. Can’t wait to try it. It sounds delicious! I love a thick soup, too, and will often add more potatoes and meat to mine. It’s getting to be that time of year when nothing beats a hot bowl of soup.